The world number two received treatment to the knee during his gruelling quarter-final win over Russia’s Karen Khachanov on Friday. 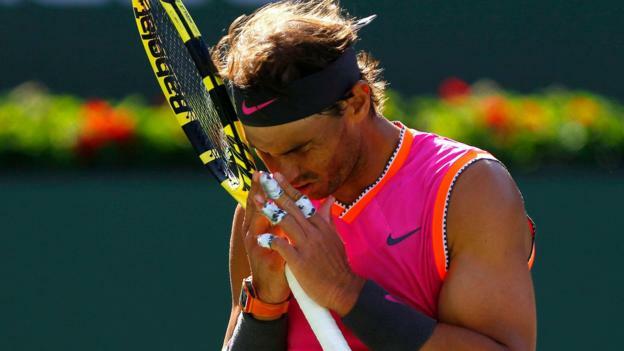 The Spaniard looked in discomfort during the match and only had a brief practice session on Saturday. Federer received a walkover to Sunday’s final, where he will play either Austria’s Dominic Thiem or Milos Raonic of Canada. “I warmed up today and I felt that my knee was not good to compete at the level I needed,” he said. Nadal completed just one hard-court tournament in 2018 – the Rogers Cup in Canada, which he won – because of his injury struggles. The 32-year-old reached the final of this year’s Australian Open, where he was beaten in straight sets by Novak Djokovic. Speaking to reporters after his victory over Khachanov, Nadal said he “could not guarantee how I’m going to wake up tomorrow”. “I love to play on hard, but probably my body doesn’t love it that much,” he added.